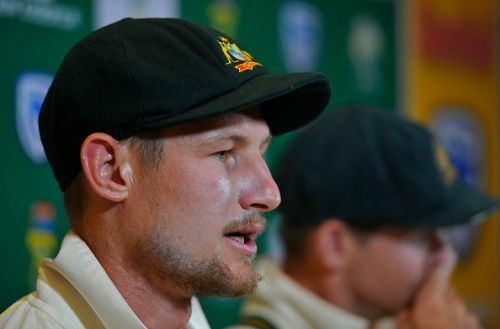 Australian batsman Cameron Bancroft, who just returned to action, after serving his nine-month ban for his involvement in the 2018 Cape Town Test ball-tampering scandal that rocked the cricket world. Playing his third match after returning against Brisbane Heat in the ongoing 2018-19 Big Bash League, Bancroft was sledged by the out-of-favour fast bowler James Pattinson during the match at the Optus stadium in Perth. As Bancroft took ten balls to get off the mark for the Perth Scorchers, Pattinson wasn't afraid to poke fun at his nine-month suspension for his role in the Cape Town ball-tampering scandal. "(Bancroft) played a couple of balls and Jimmy was into him: 'Mate you had nine months to get that front pad out of the way' and stuff like that. It was good banter. 'Bangers' is a good kid, one of the hardest trainers I've ever seen so he's going to come back really strong, but I still think there's going to be a couple of guys ahead of him (for a national call-up)," Brisbane Heat captain Chris Lynn revealed on Macquarie Radio. Opening the batting for Perth, Bancroft was struggling early on in his innings and took time to get his eye in. He took as many as ten deliveries to get off the mark and that's when Pattinson exchanged a few words with him. He was eventually dismissed for 24 from 26 balls with the help of two sixes and all his team managed was 135 runs on the board and were beaten comfortably by the Heat. Bancroft has been struggling to get going in the ongoing season as he has registered scores of 2, 19 and 24 at a slow rate in the tournament since his return. The likes of David Warner and Steve Smith, who were banned along with Bancroft, have three more months left in their one-year ban.